Tammy365: Do you feel like a disciple? Do you feel like a disciple? 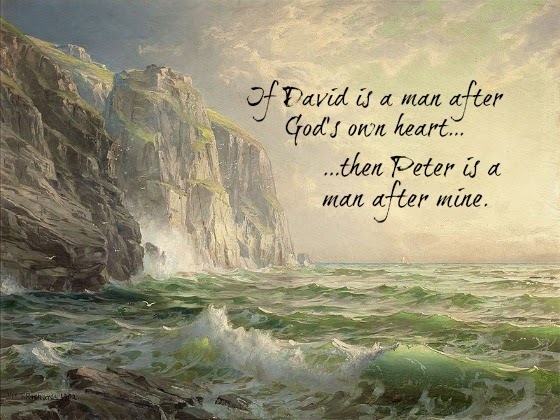 If David is a man after God's own heart then Peter is a man after mine! Peter reminds me we all fail and make mistakes. I'm feel like a Peter most days. Are you a Peter too? In Matthew 22, here comes Jesus walking on the water. The disciples in the boat thought he was a spirit and were afraid. Peter pipes up "Lord, if it be thou, bid me come unto thee on the water." Jesus said "Come." Peter walked on the water toward Jesus. Peter paid more attention to the wind around him than the Savior in front of him! He began to sink and cried for Jesus to save him. Jesus caught him saying "O thou of little faith, wherefore didst thou doubt?" When they were back in the boat, the winds ceased. Yep, I'm definitely feeling like Peter. I get distracted by things Jesus has full control of, cry out to him when my faith should believe his promises and then, I wonder why I ever doubted when He calms my storm. Poor Peter. He told Jesus he would never forsake him and later denied he even knew who he was, not once but three times. Jesus knew all these things about Peter and still changed his name from Simon to Peter which means "rock". Peter made a lot of messes but he was still instrumental in starting the church of the living God. Peter's life shows us God is faithful to forgive. He sees our potential more than our faults. Peter reminds us Jesus' disciples were humans, just like us, who put their trust in a Savior. Peter was a friend, follower and disciple of Jesus. Am I a Peter? Are you a Peter? I sure hope so!